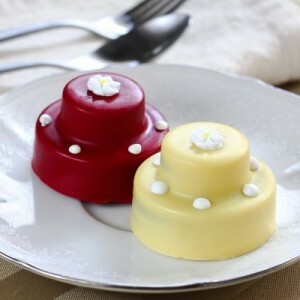 Today I wanted to find something fun and cheerful for the “fun wedding favor” find and I think these mini Oreo cakes fit the bill. First, they are made out of Oreos and we all know you can’t just eat one Oreo. And second, they’re covered in milk or white chocolate base. That’s right. We’re talking about chocolate covered Oreos. Life doesn’t get much better than that. I love these as a wedding favor idea for your guests. You can choose from 18 different colors for the chocolate that covers the Oreo “cake.” And if that’s not enough, there are four different flower options for the top of the cake. So these can truly be personalized for your wedding. And, these little beauties are hand decorated so you know they’re going to be special! Each Oreo cookie cake arrives individually wrapped and decorated with a colored ribbon, making them a very cute and unique treat for your guests. I would be willing to bet everyone eats them before they arrive home. You can find these Oreo cake favors here.